Sherease Alston has been a family child care provider for twelve years. She began teaching in 2006 and opened her own daycare program in 2010. Sherease, a Brooklyn native, began her career at Pfizer Pharmaceuticals, but she always had an entrepreneurial spirit and in 2008 decided to start her own program. She realized quickly that teaching was her passion and she works tirelessly to support children in her program with special needs. Today, she serves a total of eight children ranging in ages from 1 to 3 years old. 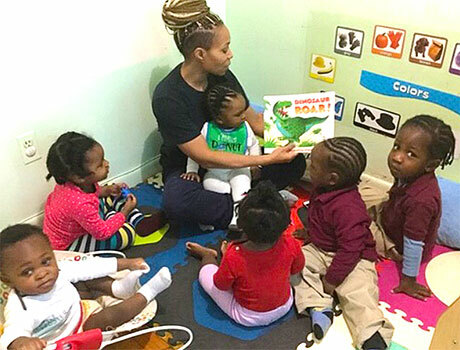 In addition to her work as a daycare owner, Sherease spends a portion of her time mentoring educators through her work as second Chair with the United Federation of Teachers. Sherease began participating in the Guttman Center for Early Care and Education in February 2017. She was motivated to join the Center’s first cohort out of a desire to enhance her already established program. In particular, she was attracted to the Center’s focus on improving both the well-being and knowledge base of providers to help them nurture the children in their care. She shared that she benefited from learning how to observe her children to better understand their behavior and developmental needs. She was also able to support parents in understanding their children better through her involvement with Guttman Center coaching and coursework. Perhaps most important, she learned how to be intuitive and to trust her own abilities and knowledge as an expert in the field which, in turn, positively affected her teaching practice and the children and families she serves.